Read past Annual and Statistical Reports on the use of the 20% historic preservation tax credit and reports about the wide variety of benefits generated by the credit. 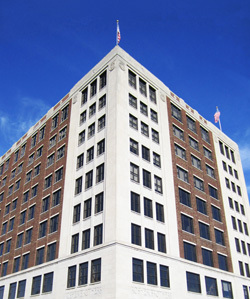 The former Roshek Department Store is the tallest building in Dubuque, Iowa. The vacant building was converted to retail uses and offices for IBM’s regional service headquarters using the historic preservation tax credit. The rehabilitation work employed over 200 people, and more than 1000 new jobs were created by the building’s new tenants. Technical Preservation Services reports annually on the nationwide use of the historic preservation tax credit. Prepared by the Center for Urban Policy Research, Edward J. Bloustein School of Planning and Public Policy, Rutgers, The State University of New Jersey. These studies examine the historical and current use of the historic preservation tax credit and provide quantitative and qualitative information about the economic and community benefits that derive from it.